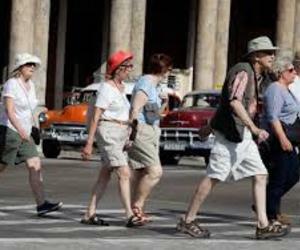 By the end of the first half of this year, 136 913 Americans visited Cuba, 79.7 percent more than in the same period of 2015, although none of them traveled as tourists due to restrictions imposed on Cuba. The Americans came to the Caribbean island under the 12 categories authorized by President Barack Obama, and were the third largest group that received this nation in that period, according to the National Bureau of Statistics and Information (ONEI by its Spanish acronym). According to ONEI, in the first six months of this year, 2 147 919 visitors arrived in Cuba, and Canada leads the list of the source markets of tourists, followed by the Cuban community abroad. The arrival of Americans to Cuba was favored after the new scenario opened between both countries, and from the flexibilizations approved by Obama. Since last May, cruiser Adonia, owned by Fathom Company, a subsidiary of Carnival, has been traveling to Cuban ports, but without a single tourist on board, since the tour is covered by the general license of educational trips "people to people", one of the 12 categories authorized by Washington. Studies indicate that the Caribbean has established itself as the main cruise market in the world with a participation quota of 40 percent of the total of this sector; more than half of the tourists' reception is concentrated in the northern part of the region, in which Cuba also occupies a privileged place. However, the Caribbean island remains excluded from these routes due to the restrictions of the blockade, a reality that begins to acquire other nuances with the granting of exceptional permissions by the US Department of Treasury. According to the World Tourism Organization, in the first half of 2016 the arrival of international tourists from all over the world increased by 4% in relation to similar stage of the previous year, and the most favored regions were Central and South America, with 7 and 6 percent of growth respectively. United States were the main contributor to this result as the main tourism source market to the Caribbean. Experts estimate that when there is no longer a ban on Americans to spend holidays in Cuba, two million of them would arrive per year in this territory, a figure that would increase to five million in the medium term. The blockade also limits the consumption of Americans on Cuba, because they cannot use their credit cards, or attend certain recreational activities. So far only MasterCard issued by Stonegate Bank and Banco Popular de Puerto Rico can be used in Cuba. According to Antonio Martínez, general manager of the emblematic Hotel Nacional, in an environment where the economic, commercial and financial siege does not exist, an American would spend five or 10 times more than what he currently does.